Zhoushan Gong and Drum as a famous folk art, is quite expressive. 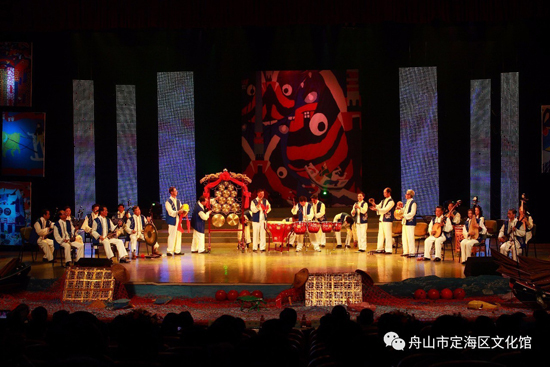 The performance is mainly accompanied with the Chinese traditional instruments, such as gong, drum, cymbal, and suona, and supplemented by Sizhu, traditional stringed and woodwind instruments. It has distinct island cultural characteristics with magnificent acoustics, unchained melody and warm atmosphere. In the past, it was usually performed in the weddings, funerals, temple fairs and other events such as sea-sacrifice ceremonies. It has been puit on stage since 1949. In the 1950s, it was formally named “Zhoushan Gong and Drum” by professional musicians, winning the golden medal of the world folk music competition at the seventh World Youth and Students Festival. On May 20, 2006, it was listed in the first batch of national intangible cultural heritage with the approval of the State Council, whose major works include “a song for fishingboat’s return fully loaded”, “Donghai Fishing song” and “a song for fishermen’s happiness”.